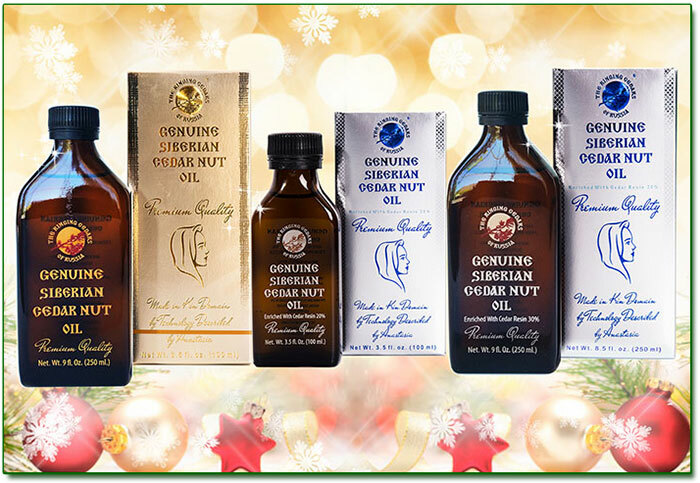 Great Promotion: Buy 4 Cedar Nut Oils for th price of 3! Buy Combo of Cedar pendant with bark + Cedar Cone + Cedar Spoon Set with 20% OFF! Buy 3 Bottles of Sea Buckthorn Oil and Get 1 FREE! 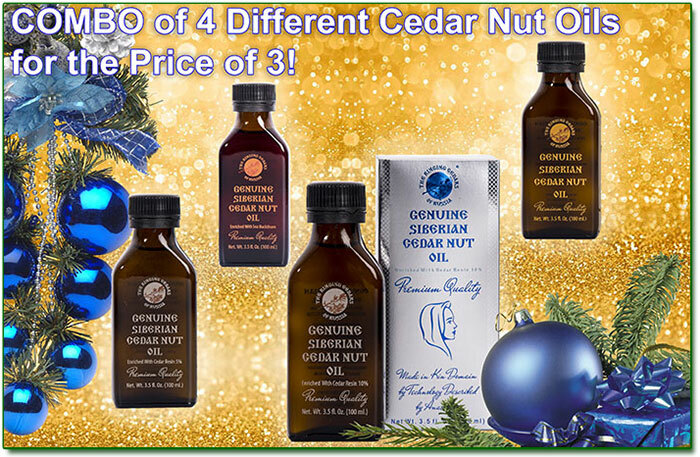 Buy 4 Different Cedar Nut Oils for the price of 3! NEW Cedar Products are Available! Buy 4 Different Pine Nut Oils for the price of 3! We stayed in a tent city near the village of Pshada. There we met Vanya, a guy who had already came to the dolmens many times and had extensive experience communicating with them. 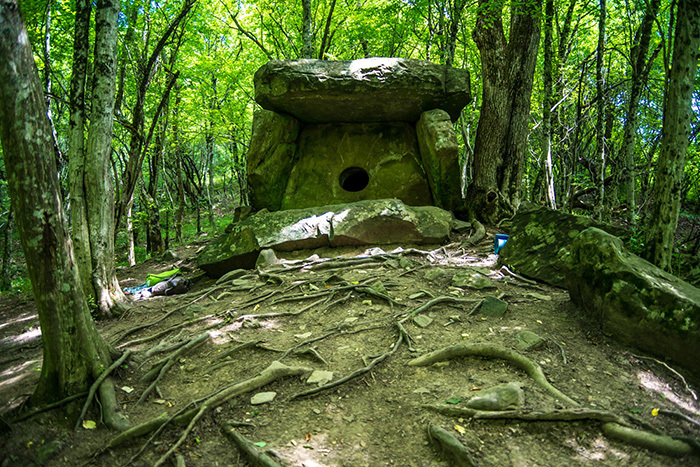 We easily reached the first dolmens, as people call them: Sun and Moon. Vyanya invited us to the Solar Dolmen, but something attracted me to the Moon Dolmen. I went to it. Deliberately, I stopped before the Dolmen, relaxation occurred immediately, my mind cleared, and I felt an unusual lightness and deep peace. I greeted the Dolmen and requested permission to enter, and I was pulled forward. At that moment, my head was compressed by a band, I felt a sharp pain and heaviness. The pressure increased, I became afraid, opened my eyes to run away, but I could not budge from the spot. And an energy began to move downwards in jolts with a grating sound. In the area of my cervical vertebra, everything began to burn, and the warmth flowed through my shoulders. I was no longer meditating, but found myself in that vibrating stream. An unusually pleasant warmth slowly flowed down through the channels of my body. The warm energy continued to move along my body's channels. I had never before experienced this type of delight. The process halted when it reached my coccyx. I felt a jolt and grasped the distinct thought: "Go and rest." I left the dolmen. It felt so good that I wanted to open the wings and fly. The warmth flowed through my body, and taking off the sweater that was no longer needed, (although a cold wind was blowing on the top of the mountain) I raised my hands and joyfully screamed with delight. 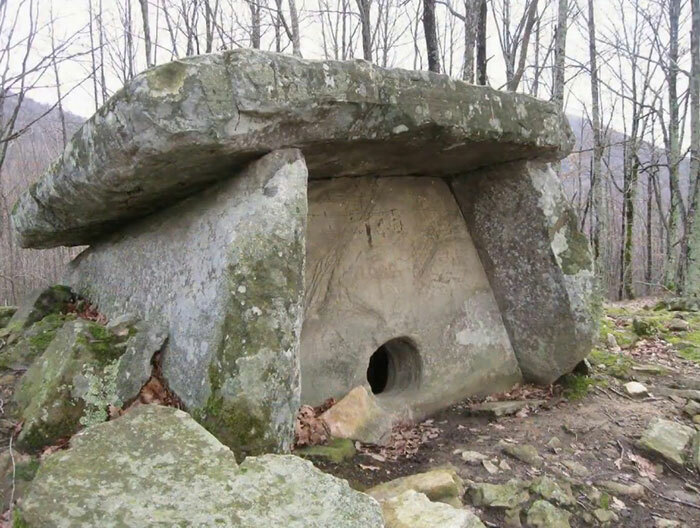 This was my first experience with Dolmens. The morning was sunny and warm. We climbed the winding path, that was leading to the top of the mountain. There were a lot of dolmens here; everything breathed with energy. Here is the first Dolmen, I greeted it, approached even closer, strange, but fear began to gnaw at me, I sensed a colossal power. My inner stress and fear did not leave me, but I nevertheless climbed in. I closed my eyes, there was something all around me, and a lot of it. I tried to concentrate on my inner peace, my body began to vibrate inside, as if thousands of small winds were somehow chaotically blowing from various directions. I nevertheless calmed down, and saw a bottomless well before me. I opened my eyes. I sensed a powerful force, colours began to break up into small beams, my body or, more accurately, my bodies were vibrating. I shifted my gaze to my hands - there were ten of them. The thought flashed through my mind: "I am disintegrating." Terrified, I scrambled outside. I felt very feverish. Once I calmed down, I realized that I needed to communicate with other Dolmens first. I came to a small, well-preserved Dolmen, next to which stood a little larger, half-destroyed dolmen. I relaxed, mentally greeted the small dolmen and asked for permission to enter. Some kind of warm feeling pulled me forward, a pleasant smell appeared, and I climbed inside to receive knowledge. I realized that there is no past, present, or future. There is no time, no duality! It's awesome, simple and deep! But I considered it unnecessary to open the curtain of my future in this cycle of my life path. Delight and love overwhelmed me, I seemed to have grown stronger. I got out of the dolmen happy and went back to the first dolmen, because I no longer felt any fear. I came right up to the Dolmen and placed my palms on the slab, warmth came from the depths of the stone. An irresistible desire arose to fuse with this warmth, this enveloping feather-bed. I got down on my knees and placed my forehead against the wall: the warmth began to flow throughout my entire body. Images appeared: something in the form of a jellyfish swimming past and a blossoming flower. Three different light sources vibrated around me, creating a dense cocoon. I seemed to fall into a powerful energy stream. Something came close to me or I was flying to meet it. I clearly saw our planet, the stars, the cosmos. An immense gate appeared, resembling the outline of an eye-socket, and out of it flew our planet. Then the Earth moved back - some sort of spaceship hung above the planet. I felt a disturbance, and everything quickly began to change, the tempo increased. Out of the spaceship came rays of energy, they wrapped around Earth, straight lines began to change. At that instant, I felt the intense pain of the planet, and I became afraid. I felt that something very frightening and incomprehensible was happening on the planet, the water on the planet seemed to stand vertically, like an enormous mushroom. I cried and automatically drew something in my notebook. My mind feverishly defended itself: "But I still don't believe it, there are no other civilizations, no extraterrestrials, these are all just fabrications of the weak-minded... But why are some opposing others, why are they resisting the experience of our planet, what is there to be afraid of?" 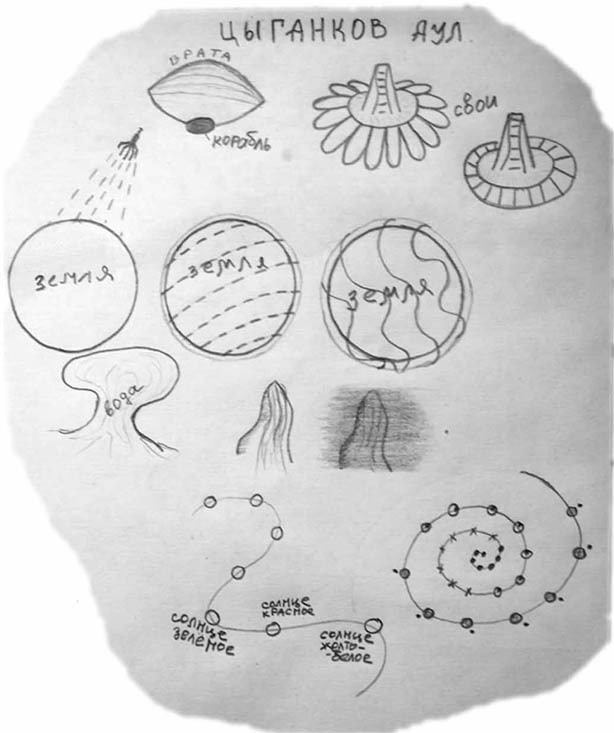 Then I saw images with other ships, resembling blooming flowers, and when they landed, they became like pistils or pyramids. From them emerged "good people," who radiated snow-white, pure energy, they were even shining - and BLEW LIFE INTO A SEED. And I was still crying when suddenly huge yellow eyes were staring at me (the eye-sockets were normal, even attractive, but instead of a pupil and the white, there were rays of yellow energy). In surprise, I flew up out of my body, and there again was the gate and other ships. I abruptly jumped up, as if scalded, and banged my head on the slab. - "I have to calm down." But my brain was feverishly whispering, "I've lost my mind." Between my eyes, in my forehead, it was as if something was coming out and burning, like after a compress with a burning hot iron. I attempted to hold my forehead in my hand, but it did not become easier. It was in this sorry state that Ilya found me, followed by Vanya. Ilia and Vania anxiously asked - "What happened?" In my brain sounded - "I lost my mind!" I held out a notebook with sketches. Vanya said that this is familiar to him. I looked at him with sorrow and thought that it was not just me who should surrender in a psychiatric hospital. - "It's all described by Anastasia! Haven't you read?" – Vania asked. -	"No, I haven't" – and I added – "I do not believe in aliens, and I knew nothing about the catastrophes of the Earth, I only read about the great flood." 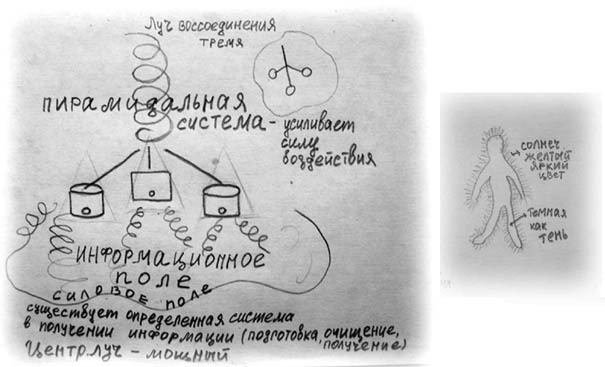 Vanya began to tell me about what is written in the books of Vladimir Megre. I was surprised that everything coincided with what I saw. I recovered little by little. We moved to the tent camp, and Vania kept telling me about the information he had read from the books, and soothed me. And I mentally thanked him that he was there at the right moment, supported and reassured me. -	"As soon as I fly home, I will read all the Ringing Cedars of Russia books!" - I decided. P.S. Two years have passed, and I am again in these lands! I climbed into that same Dolmen, sat down and quieted myself in a meditation in the hope of seeing something new. But everything, down to the smallest detail, was like the time before. We set off for the Sun Dolmen. Now not expecting anything new, but with anxious joy and deep respect, having requested permission to enter, I climbed into the heart of the Dolmen. I relaxed immediately - the same denseness, the same vibrations, tunings, but what was this? Suddenly I was enveloped, as if in a whirlwind, by a blindingly white energy and, having collected in one spot, it began to become dense, and an image formed of a very young, handsome youth, but something was off... I realized that his hair and sparse beard were completely grey, and his eyes were tender and fathomless... it is difficult to put into words. I opened my eyes in delight and stared straight at the vision, which had become somewhat less vivid and distinct. I called to Ilya to climb into the Dolmen with me, and the picture disappeared, but the sensation of being with the truly great remained. I climbed out of the Dolmen, but did not want to leave. I felt like touching the slab with my entire body. My palms felt warmth, not of the stone, but of energy emanating from the depths, my forehead seemed cold in contrast to this sunny, tender warmth. Closing my eyes, I saw the silhouette of my body as from the outside. Not understanding why, but being moved by something, I took a step back, the silhouette remained in front of me. And I distinctly saw around it a luminescence resembling the rays of the brilliant sun. Ringing Cedars of Russia's Cedar Nut Oil with Sea Buckthorn berries is also known as Sea Buckthorn oil is an infusion of Sea Buckthorn berries on the base of Cedar nut oil. As Sea Buckthorn is known to be a strong skin repair product, it is widely used in luxurious hair and facial cremes, as when it is applied externally it can assist in: fighting dermatological diseases, improve skins complexion, reduce wrinkles and calms an irritated skin. Simply, massage your body and face in circular motion to allow the Extract to penetrate deeply into your skin and then wash out in 10-15 minutes. 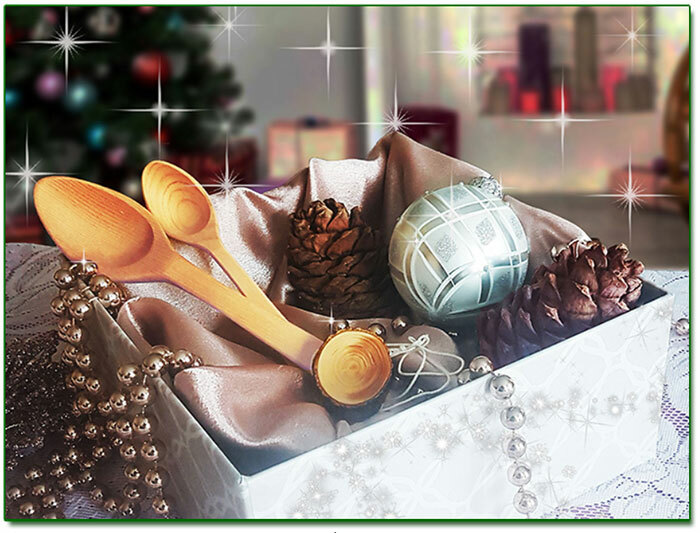 CHRISTMAS COMBO: CEDAR PENDANT WITH BARK + CEDAR CONE + CEDAR SPOON SET with 50% OFF! SET OF 4 DIFFERENT OILS FOR THE PRICE OF 3! Do you want to give your loved ones a tasty and healthy gift, but do not like traditional candy boxes? 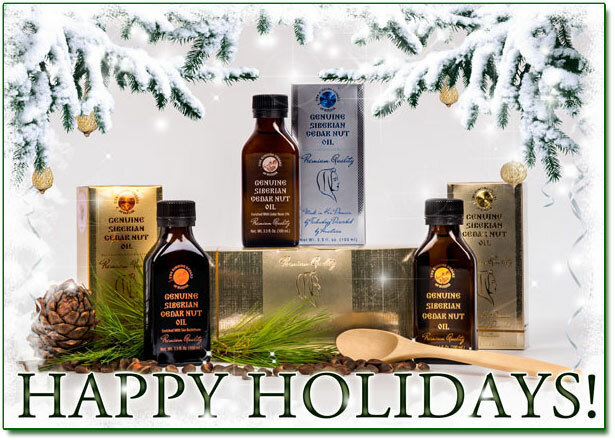 Given Christmas set includes 4 delicious 100ml oils under Ringing Cedars of Russia brand: cedar nut oil, cedar nut oil enriched with sea buckthorn and cedar nut oil enriched with cedar resin 5% and 10% for the price of 3. This set is a great opportunity for your loved ones to try different infusions based on cedar oil. The set can also be divided into several different gifts. The beautiful packaging of Cedar nut oils and the healing power of them will add elegance and meaning to your gift. NEW RELEASES OF THIS YEAR! Proper nutrition in the cold season is a serious task. Such a thoughtful gift, like cedar nut oils, can solve this situation. 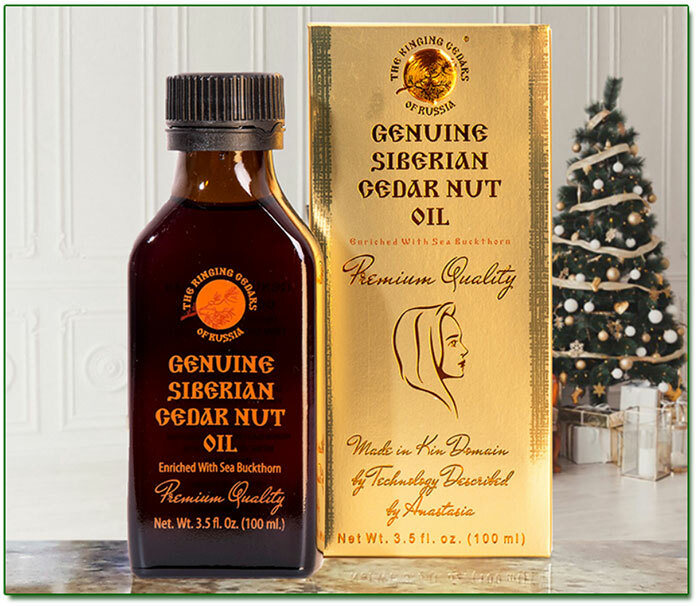 Ringing Cedars fo Russia company offers you new releases of this year: 250ml Cedar nut oil, 100ml Cedar nut oil enriched with cedar resin 30% and 250ml Cedar nut oil enriched with cedar resin 30% - all eatable! These oils are full of natural vitamins, minerals and essential fatty acids that will support the health of your loved ones for many months. In addition, Cedar resin has antibacterial, antiparasitic and anti-inflammatory properties. Just think about how it will be nice to your loved one to receive a gift that brings health! This is a wonderful gift that demonstrates your concern! after reading the books for a couple times I started changing my life inspired in Anastacia sharing, I have changed my perspective and the way I see different things. I absolutely love the Ringing Cedars series books about Anastasia. Kudos. The Anastasia books are probably the single most important books in our library. bought the pendant from your site and I love it. I wear it everyday. I own 4 pillows now, but could easily see 1000 in my home. Ringing Cedars Of Russia wonderful! I need these all over my house. I am completely obsessed with them and how beneficial they are! Kept me from getting sick when my partner had a nasty flu, and my hair is growing fast now. The list of benefits from the phytoncides is just never ending. So many! I am 48, and this is seriously the best thing that I have ever found in my lifetime. I am so very excited about these pillows! Hello! I just received my necklace and amulet [Eternal Love] and I wanted to thank you so very much. It came so quickly and it is absolutely beautiful and the price was fantastic. Thanks so much and love to you! I have purchased Ringing Cedars products for years. Their operations and customer service are really 5 star. Buying from you has been the best on-line experience I've ever had. The service is friendly, the shipping is fast, and the products are great. I couldn't have been more pleased. Based on my experience, Ringing cedars of Russia's customer service is great, and it shows that customer satisfaction is important to them. Earnest request to authors of articles and scientific works to please send your materials to us to the address info@ringingcedarsofrussia.org with a subject "Articles" . Upon a separate agreement your works may be published in the internet newspaper "The Earth" , in separate collections, in the Resource Library of the Source of Life Association, and on the pages of the websites devoted to the "Ringing Cedars" movement. Please send your works of art, poems, songs, and paintings, inspired by the books of Vladimir Megre to the following address info@ringingcedarsofrussia.org with a subject "Art" . Best ones will be published in "The Earth" Newspaper. You can direct your questions to the Letter Department of RingingCedarsofRussia.org website. Your question will be answered within 7 business days. Word of mouth is our best advertising. The world needs the Ringing Cedars to be widely available in English, please tell your friends and neighbors about us. Better yet, share our Web site, http://www.RingingCedarsofRussia.org, with them and help spread the word. It is wonderful if Anastasia's dream comes true in this country too. If you found this e - news useful to you please forward it to your friends. Copyright 2006 - 2018 http://www.RingingCedarsofRussia.org, All Rights Reserved.